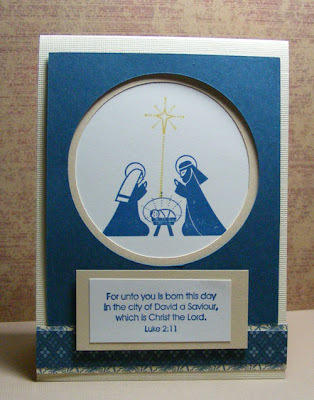 Lisa E Design Blog: Cricut to the rescue! If you took my card class in September, this card will look very familiar. You will also remember that even though I had already cut the circles out for our class, it was still time consuming to assemble. Well, on Friday I made 12 of them! I knew I had to come up with an easier way to cut these card pieces. For the original card, I cut circles out of rectangular pieces of Not Quite Navy and Barely Banana cardstock with my Creative Memories circle cutters. I love their circle and oval cutting system. I've had mine for many years and used them countless times. However, in this case it was tedious cutting all this circles just where I wanted them and making sure the Barely Banana layer didn't stick out from the N.Q. Navy one. To make things go smoother for these cards, I used the Sure Cuts a Lot (SCAL) software and my Cricut. I laid out the rectangle with a circle inside - it is easy to specify exactly the size cirle you want) and then cut a sample of each size. I then just copied this design over and over to cut as many as possible from each 12x12 paper. (The sample above uses a tan cardstock because I was out of Barely Banana.) The only complaint I would have is that you can't cut all the way to the edge of the 12x12 sheet. Looks like it goes only 11 1/2" x 11 1/2" but I haven't investigated enough to be sure. There was still a lot of assembly to this card but it went much faster and more precisely. I didn't have to worry about cutting the wrong size circle. I could spend my time designing and stamping which is much more fun. I love it when you get a new tool and find even more cool things to do with it than you thought. Ingredients: Stamps: Season of Grace from Stampin' Up! Paper: SU! DSP Bella Blue, Not Quite Navy from a Patterns Pack, Not Quite Navy and Whisper White cardstock. Other cardstocks are from Hobby Lobby. This is a wonderful Christmas card. Love the elegant layout.